A nearly $1 million grant from the National Science Foundation will help computer science researchers at the University of Arkansas lead an interdisciplinary team of educators who will train and certify Arkansas school teachers in computer science education. FAYETTEVILLE, Ark. — Computer science and engineering researchers at the University of Arkansas will use a nearly $1 million grant from the National Science Foundation to lead an interdisciplinary team of educators who will train and certify Arkansas school teachers in computer science education. Over the next three years, Training Arkansas Computing Teachers, or TACT, will prepare 50 Arkansas teachers for licensure to teach the new advanced placement computer science principles course, introducing high school students to basic computer programming and applications. 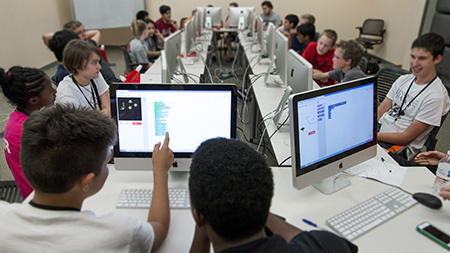 The program’s goal is to increase student awareness and interest in computer-related professions. Arkansas Gov. Asa Hutchinson signed Act 187 into law this year, requiring computer science courses to be taught at all Arkansas public high schools and charter schools. Arkansas is the first state to mandate computer science education. Thompson and Bryan Hill, assistant dean for student recruitment and diversity, honors and international programs in the College of Engineering, will serve as administrators for the program. They will work closely with the Honors College’s Advance Placement Summer Institute and UAteach, a program that combines in-depth science and mathematics education with teacher preparation. UAteach is a partnership between the J. William Fulbright College of Arts and Sciences and the College of Education and Health Professions, addresses the shortage of secondary mathematics and science teachers in Arkansas. The Training Arkansas Computing Teachers program will offer in-service training for existing high school computer science teachers by expanding the Honors College Advanced Placement Summer Institute to include a new Computer Science Principles Course. Additional teachers interested in computer science licensure will attend a summer “boot camp” prior to joining the Advanced Placement Summer Institute. Pre-service training will be offered to students going through the UAteach program.